Working hours: church - 9 a.m. to 6 p.m.; museum - 1 p.m. - 5 p.m.; closed on Wednesdays. 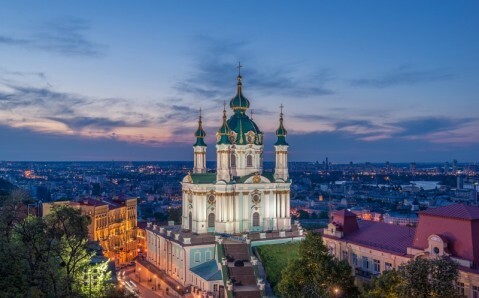 Rare in its beauty and grace, the St. Andrew's Church, stands on a hill in the historic center of Kyiv. 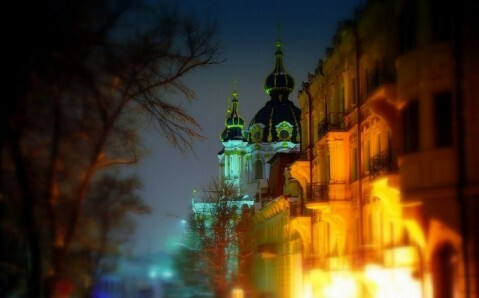 It is one of the most famous Orthodox temples in the Ukrainian capital. This amazing construction, rightfully considered to be a real work of art, is among the most remarkable of the city’s landmarks. 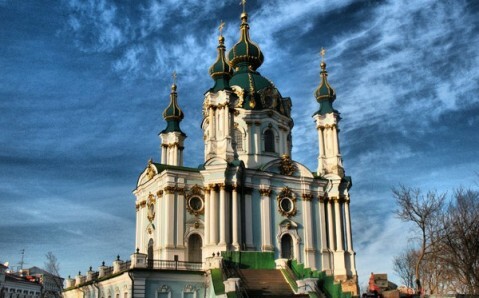 The St. Andrew's Church owes its origin to the Russian empress Elizabeth who, intending to have a summerhouse in Kyiv, ordered a temple to be built. It was erected in 1754, at the place, where, according to legend, St. Andrew the Apostle made a cross during his travels to the Scythian country. 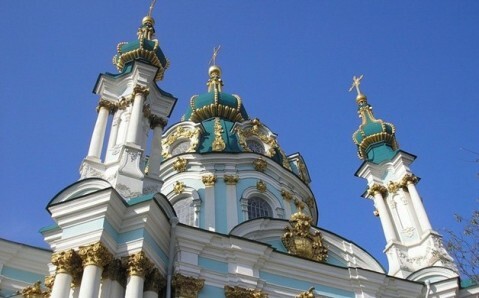 Famous architect Bartolomeo Rastrelli designed this five-domed church with one cupola in baroque style. It is still called Rastelli’s 'swan song.’ The temple is in the form of a cross, and its edges are decorated with fancy ornamental towers. 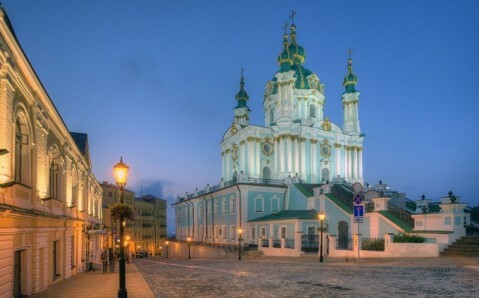 As any baroque object, the St. Andrew's Church is notable for its unusual elegance, luxurious decor, exquisite refinement, and airiness of form. But even more impressive is the church’s interior – suited for a luxurious palace – which was also designed by the great Rastrelli. 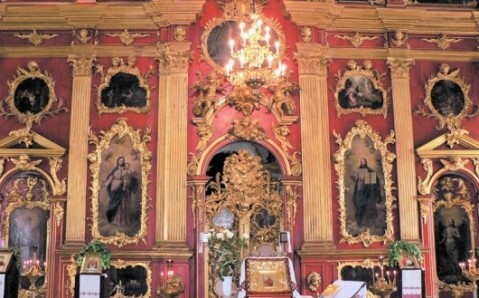 Its key decoration is the original bright-red iconostasis, made of linden wood and covered with gold. Today, the St. Andrew's Church is a working temple, and services are conducted here. It also houses a museum, whose collection tells the difficult history of this architectural masterpiece. Найкрасивіша з усіх церков! Просто неймовірна! Злая церковь закрыла смотровую площадку, а вам хочется увидеть шикарный вид на город? Не беда. Идите на уровень ниже, мимо музея войны, прямо и за угол вверх по оранжевому водостоку. Никаких заборов! 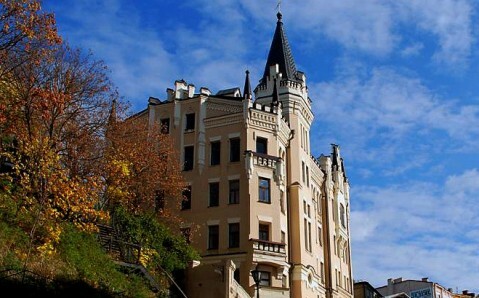 Для мене це найгарніша церква в Києві. Головна прикраса Андріївського узвозу. Оглядовий майданчик закритий з причин реставрації. 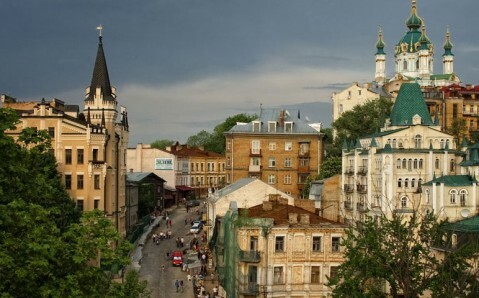 Церква в середині доволі компактна і дуже гарна. Работа знаменитого Растрелли. Прекрасна как снаружи, так и внутри! Вечером с подсветкой завораживающий вид! Православный храм в честь апостола Андрея Первозванного, построенный по проекту Растрелли, 1754 г. В настоящее время используется для богослужения Украинской автокефальной православной церковью. Это Киев и история такого больше нигде нет. Major Baroque church was constructed in 1747–1754, to a design by the Italian architect Bartolomeo Rastrelli. У церкви есть отличная смотровой площадка - Киев как на ладони.Особенно хорошо утром - когда нет туристов и лотков с сувенирами. Построена в стиле барокко 1747-1762 гг. зодчим И.Ф. Мичуриным по проекту выдающегося архитектора Растрелли.